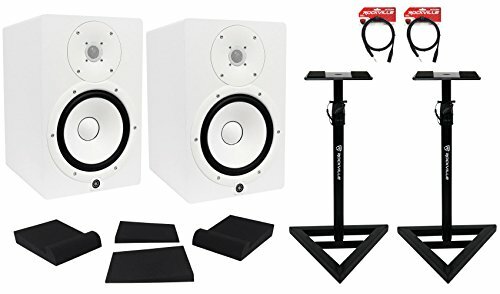 Yamaha HS8 W (White) 95 Watts / 2-way bass-reflex bi-amplified nearfield studio monitor. Woofer 60 Watts / Tweeter 35 Watts / 95-Watt Bi Amp. 38Hz - 30kHz frequency response. ROOM CONTROL and HIGH TRIM response controls. XLR and TRS phone jack inputs accept balanced or unbalanced signals. Speaker type: 2-way bi-amp powered studio monitor. Frequency range (-10dB): 43Hz - 30kHz. Components:. LF 6.5" Cone. HF 1" Dome. Crossover: 2kHz. I/O connectors: XLR3-31 type (balanced), PHONE (balanced). Power consumption: 55W. Shape: Bass-reflex type. Cabinet material: MDF. Dimensions: W: 210mm (8.3") x H: 232mm (13.1") x D: 284mm (11.2"). Net weight: 8.2kg (18.1 lbs.). Others: LEVEL control (+4dB/center click) , EQ: HIGH TRIM switch (+/- 2dB at HF) / ROOM CONTROL switch (0/-2/-4 dB under 500Hz). Rockville RRS190S: Monitor Isolation Pads. 3 Angle High Density Foam. 7.5" x 9.5". High quality, High Density Foam. Eliminates vibrations and unwanted noises in your studio. Price is for (2) pads which accommodates (2) speakers. Studio Monitor Stands (Pair). Adjustable Height. Steel Construction. Black Color. Weight capacity: 80 lbs.. Adjustable height Range: 33-45 inches. Base: 17.7 x 17.7 x 17.7 inches. Top Plate: 9.05 x 9.45 inches. Tube Diameter: 1.5 inch- 1.37 inch.